In February 2001, we joined a group of railfans for a trip to the railroads of Guatemala and El Salvador. We have created a Guatemala / El Salvador Photo Album to share impressions from this trip with you. 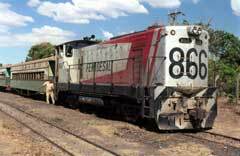 The railfan trip was organized by Trains Unlimited Tours, the worlds only travel agent offering trips for the railfan, in Latin America (i have no business relation to them other than being a customer). Using charter trains allows to stop trains at interesting locations, and do photo run-bys. There is no passenger service any more on the Ferrovias de Guatemala, and only local passenger service in remote areas of El Salvador. From Guatemala City to Zacapa. The trip started on a doubleheader steam train from Guatemala City Main station. The station is not used anymore, as there is no passenger service on this road any more. The train was pulled by two powerful Baldwins, the only two left in operable condition. 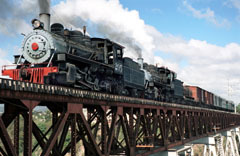 The picture to the left shows the two of them pulling our train across a steel bridge just out of Guatemala City. 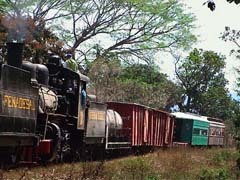 A diesel engine waited in Metapan to pull our train southward to San Salvador. Special permission allowed us to sit or stand wherever we wanted (as soon as we signed a waiver ...). This made this trip truly unforgettable, because nowhere else in the world have i been able to leisurely sit on the roof of a caboose at the end of a train, and dream my way into the setting sun and upcoming night. 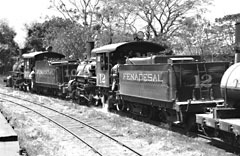 The FENADESAL have two early Baldwin steam engines left in good condition, they were both waiting steamed up at the new San Salvador station for the ride west to Sonsonate. Is this a scene from 120 years back? The two Baldwin engines are about that old, and the traveling speed is rather lower today than it was in the heyday of the ferrocarriles in this country. A bright red railbus covered about half of the first bit of track, but broke down, wiht an fuel pump problem. We had to wait for the following regular mixed train to push us into the next station. We were the first train for more than two years pulling into Santa Ana. We then spent some days traveling along the usual tourist tracks in the Highlands of Guatemala. 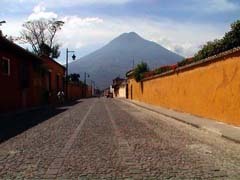 We started our short trip in Guatemala City, where our travel agency picked us up for the short drive over the mountain highway to Antigua Guatemala. Antigua is mainly colonial style buildings, and only very few new buildings at the outskirts of the town. The City area looks like a living museum, with a busy plaza surrounded by the main 'official' buildings. 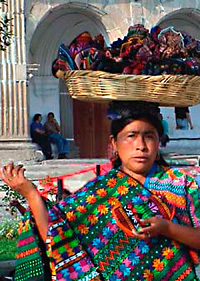 Street merchants, mainly women, sell the colorful embroidered marvels made throughout the country. Picturesque restaurants and coffee shops in the buildings around the plaza and the neighbouring streets invite visitors to take time for refreshments and a small lunch. They are marvellous places to spend time writing travel diaries, postcards or plan where to go next.We strolled around town for well over good two days, through the magnificent old churches and convents, all of them damaged by the numerous earthquakes that hit the area. We had the pleasure to stay at Latin Americas most beautiful hotel here, the Casa Santo Domingo, which is built into an old dominican monastery. Never in my life have i been in a hotel that had its ows candle factory. The hotel is lit by thousands of candles, electric light is used only where necessary, a dream. Part of the monastery is conserved as a museum, and open to the public. The church of this monastery is Gustemalas most famous place for weddings and other important days in peoples's life. 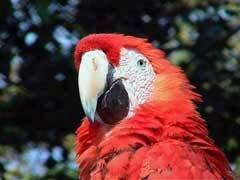 To sum up, Antigua is the place to go when you visit this country, Gua City can be skipped. 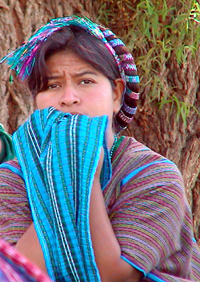 We then spent some days traveling along the usual tourist tracks in Guatemalas Highlands. 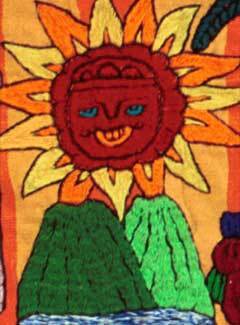 We began in Antigua Guatemala, then drove on to Lake Atitlan, then visited the famous market in Chichicastenango.